Today, a "China-Africa community with a shared future" is the buzzword to describe China-Africa relations. Behind the popularity of the phrase lies the unremitting effort by leaders of China and Africa to forge such a community by deepening political mutual trust and pursuing common development. Chinese President Xi Jinping is currently on a trip to Senegal, Rwanda and South Africa. He will also attend the 10th BRICS Summit in Johannesburg on July 25-27 and visit Mauritius during a stopover. This is Xi's fourth visit to Africa since assuming office as Chinese president in 2013. Many African leaders, including Cameroonian President Paul Biya, Namibian President Hage Geingob, and Zimbabwean President Emmerson Mnangagwa, visited China this year. Klaus Schade, a research associate at the Economic Association of Namibia, said the frequent mutual visits by Chinese and African delegations are a result of the historical friendship, which continues today. China's top legislator Li Zhanshu and Wang Yang, chairman of the National Committee of the Chinese People's Political Consultative Conference, have visited Africa recently. Chinese State Councilor and Foreign Minister Wang Yi's visit to four African countries in January followed a long tradition. For the past 28 years, China's foreign ministers have always chosen Africa as their first destination abroad. In an interview with Xinhua, Netumbo Nandi-Ndaitwah, Namibia's deputy prime minister and minister of international relations and cooperation, said frequent visits are necessary as they strengthen ties between nations and more importantly, between governments. 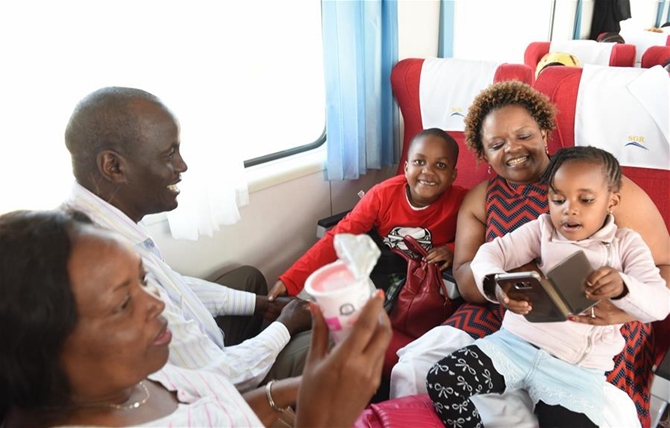 "The last decade has witnessed a highly intensified frequency of mutual visits between government officials of China and a large number of African countries," said Gerishon Ikiara, an international economics lecturer at the University of Nairobi. "This indicates the seriousness with which the visits were taken by both African countries and China." Ikiara called the frequency and high caliber of Africa-China interactions a clear indication of the sharp increase in their mutual desire to enhance and diversify Sino-African socio-economic, diplomatic and political relations. Tarah Shaanika, former CEO of Namibia Chamber of Commerce and Industry, said, "For many years, the Chinese economy has been growing rapidly, which fueled the growth of other economies, especially those in Africa." Lauding the China-Africa comprehensive strategic cooperative partnership, he said being the second largest economy with the largest population, China "has a huge market which no one can afford to ignore." This year marks the 40th anniversary of China's reform and opening up. The past four decades have not only witnessed China's economic achievements but also the leapfrogging development of China-Africa economic and trade relations. On July 12, in Nigerian capital Abuja, the China-assisted Abuja light rail transport system, the first of its kind in West Africa, was commissioned. Nigerian President Muhammadu Buhari called it a milestone in the history of the country. "I am very optimistic that a modern rail service would bring about a boost to the Federal Capital Territory (FCT) economy and greatly enhance social life," he said. Abuja is located in the FCT. In recent years, such infrastructure projects undertaken by Chinese firms abound in Africa and have become symbols of the strong China-Africa economic tie. These include the Nairobi-Mombasa standard gauge railway in Kenya and the Ethiopia-Djibouti railway, among others. Thomas Kwesi Quartey, deputy chair of the African Union Commission (AUC), said Africa and China have pragmatic and close cooperation in the spirit of South-South cooperation across sectors like health, education, infrastructure development, trading and capacity building. "China remains an example for us ... China has showed that it has been able to pull its so many millions of people out of poverty," he said. A report last year by Ernst & Young, the London-based multinational professional services firm, said China became the single largest contributor of foreign direct investment (FDI) in Africa in 2016. It said between 2005 and 2016, China invested in 293 FDI projects in Africa, totaling an investment outlay of 66.4 billion U.S. dollars and creating 130,750 jobs. Data from the African affairs department of China's Ministry of Foreign Affairs show that China-Africa trade grew from a mere 765 million dollars in 1978 to 170 billion dollars in 2017, an increase of more than 200 times. China has also maintained its position as Africa's largest trading partner for eight years in a row. Cumulative Chinese investment in Africa has grown from none to over 110 billion dollars in the past 40 years. On international and regional matters, China and Africa have maintained close coordination. Of the five permanent members of the UN Security Council, China is the largest contributor of peacekeeping force in Africa, with more than 2,000 Chinese troops carrying out missions on the continent. During his 2013 visit to Africa, Xi emphasized in a speech in Tanzania that China and Africa are a community with a shared future. Similar history, common development tasks and shared strategic interests have created a tight bond between the two, he said. University of Nairobi lecturer Ikiara said since the 1960s, when the majority of African countries became independent, China is regarded as having special ties with Africa. The notion of a community with a shared future is the "key defining feature" in Sino-African relations in the post-independence period, he added. Raphael Tuju, secretary general of Kenya's ruling Jubilee Party, said China has won the hearts and minds of Africans for assisting the continent with loans and grants to improve infrastructure, which remains the biggest challenge to Africa's development. "More countries in Africa are agreeing to enter into the China-Africa comprehensive strategic partnership of cooperation. This is an indication of the valued relations between China and Africa and the commitment to ensure long-term strategic partnership," Tuju said. China will host the Forum on China-Africa Cooperation (FOCAC) Summit in Beijing in September. AUC's Quartey said the summit has been a vehicle for continuing cooperation in bilateral, multilateral and continental spheres.